Can’t enjoy an outing without your four-legged friend? Runyon Canyon Park is perfect for you both. This park includes several miles of trails that will get you and your pup in shape for the summer. Warning: parking is tricky, so get there early. This jewel in the heart of Downtown hosts music festivals and free concerts throughout the year. 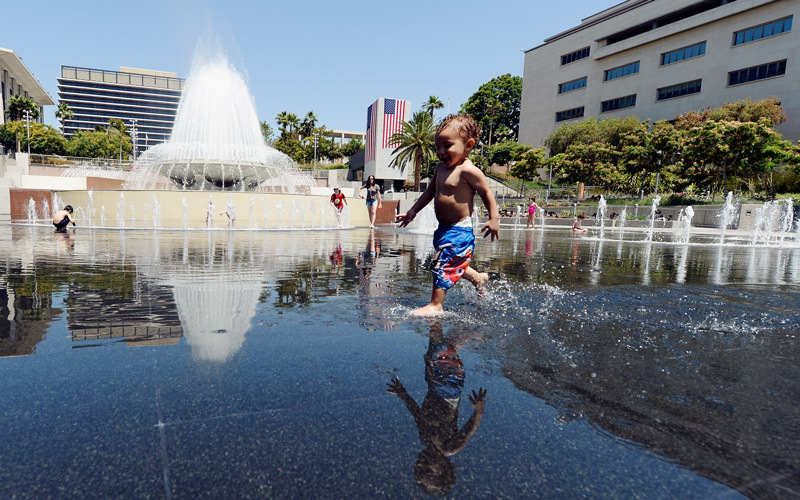 Tucked about a block east from the Los Angeles Music Center, this park is perfect for visitors and natives alike to explore and enjoy an authentic Los Angeles vibe. Paddle yourself into shape by renting a paddleboat at this manmade lake in Echo Park. The perimeter of the park is riddled with food vendors selling churros, fresh fruit and danger dogs. 100 N Toluca St, Los Angeles. Free parking? Check. Outdoor outlet to charge your phone? Check. Stunning view of downtown? Check. Make your way over to Vista Hermosa Natural Park and take that classic picture on the bench. 929 Academy Rd, Los Angeles. If peace and tranquility are what you’re looking for, mosey on over to Elysian Park. The roughly 600-acre park offers a range of trails for hiking, but the true gem is its iconic rope swing which overlooks the 5 Fwy. Walk, run, jog, or stretch out by the coast. This park offers yoga classes and excellent trails along the beach, not to mention stunning views of the Pacific. 905 Loma Vista Dr, Beverly Hills. For the perfect weekend jaunt, head to Greystone Mansion and Garden for a lovely picnic or romantic getaway. Make sure to visit the Koi pond. 3160 Canyon Lake Dr, Los Angeles. If you don’t have an insta standing in front of the Hollywood sign, are you even from L.A.?. Pick up your pup and head to Lake Hollywood Park. This designated dog park destination offers several picnic tables for the humans and fenced-in play areas for dogs. 7600 Beverly Blvd, Los Angeles. 7550 E. Spring St. Long Beach. Nestled between the San Gabriel River and 605 Fwy, this animal and plant sanctuary is perfect for a leisurely Sunday. The Center has a 1 and 2 mile dirt trail, 1/4 mile paved trail, and an educational center perfect for children and nature enthusiasts alike. 1485 Virgina Rd, San Marino. Known as one of the cleanest parks in Los Angeles, this little gem is worth the $4 parking for non-San Marino residents. The area has two paved lanes, one for walking and the other for running. 6300 Hetzler Rd, Culver City. Reach the top of this trail to feast your eyes on the iconic Hollywood sign on your right and Marina Del Rey on your left. Sure, most of the steps are steep and uneven but for views like this it’s worth it. 3601 S Gaffey St, Angel’s Gate Park Los Angeles. Gifted to the city of Los Angeles by the Republic of Korea in 1976, this bell is a symbol of peace, friendship, and honor for those who fought in the Korean War. This beautiful park should be on everyone’s L.A. bucket list. 6300 Balboa Blvd, Van Nuys. This place has it all: a dog park, a skate park, a recreation center, a horticulture center, and a lake. Keep an eye out for the cherry tree blossoms during the spring. 2600 Franklin Canyon Dr, Beverly Hills. This 605-acre park rests between Los Angeles and the San Fernando Valley and offers gorgeous views of wildlife. Stop by Franklin Canyon Park’s Sooky Goldman Nature Center, the Sam Goldman Amphitheater, or the Eugene and Rosenfeld Auditorium as an added bonus. Described as “so adorable,” this tiny park packs a punch. Enjoy the succulents, homey antiques, and gorgeous wildflowers. 1501 Will Rogers Park Rd, Pacific Palisades. Activities at Will Rogers include hiking trails, horseback riding, guided tours, vista points, and museums. Check out this historic estate for a picturesque getaway. 1615 Ocean Ave Santa Monica. This 21st-century gem offers free wi-fi, a playground, a natural amphitheater, shaded picnic areas, and lush gardens. Just a short walk from the expo line. 13650 Mindanao Way, Marina del Rey. Named the crown jewel of the Marina, Burton W Chace Park offers a multipurpose room, picnic shelters and excellent harbor views. Sit back and relax on a leisurely Sunday or enjoy a barbecue with friends. 1245 N Spring St, Los Angeles. Directly adjacent to Chinatown, this 32-acre open spaced park provides visitors with intimate views of downtown. Historic and untouched, Los Angeles State Park offers running and biking trails. Drop by during the weekend and catch hobbyists kite fliers.